As you read this article, an epidemic is sweeping the nation. It flies across schools, targeting a very specific and very vulnerable group. Everyone, at some point, will contract this disease. The cases vary from mild to extreme, and each student will experience symptoms differently. The majority of the time, students will not even know they are afflicted with this disease. The disease is sneaky, enhancing normal behaviors of the students and appearing so subtly that by the time others realize this student has been infected, it is too late. The student has senioritis. 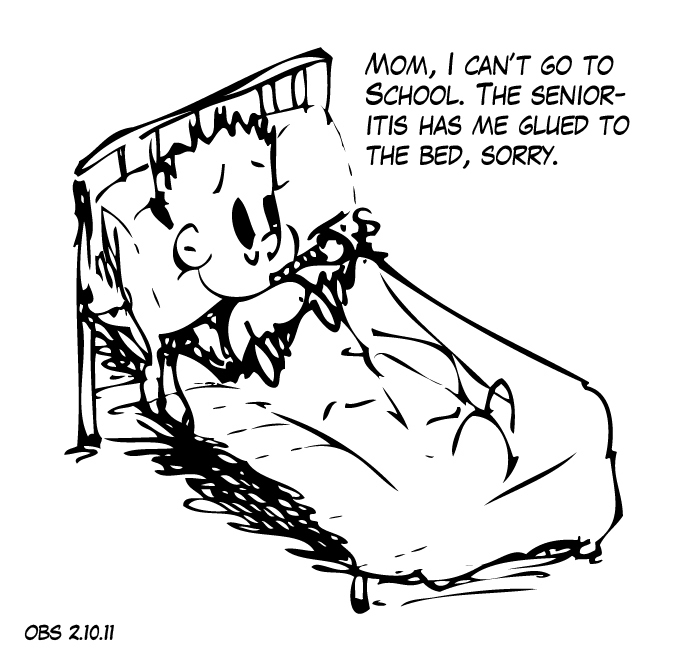 The Merriam-Webster online dictionary defines senioritis as “an ebbing of motivation and effort by school seniors as evidenced by tardiness, absences, and lower grades.” Ms. Collins, Oceana’s academic counselor, adds that other common symptoms include some combination of denial, procrastination, forgetfulness, not doing much homework (if any at all), spending too much time socializing or on the internet, increased irritability, daydreaming, restlessness, boredom, new or increased use of drugs or alcohol, and a strong avoidance of anything to do with school. 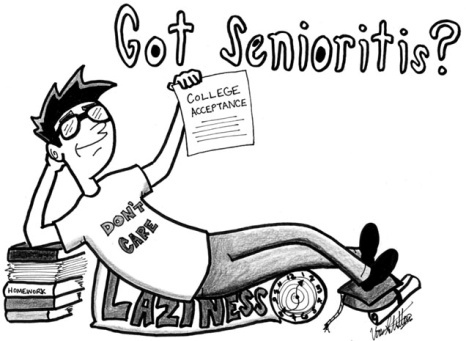 In most cases, senioritis only exaggerates common behavioral patterns of the student. While symptoms of senioritis can appear at the start of the year, typically senioritis is strongest in the spring semester. 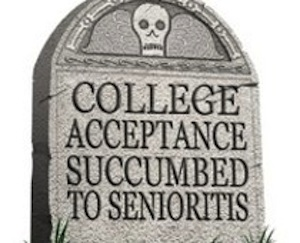 This is because by late March most seniors have their college acceptance letters in their hands and, at Oceana, the pressures of Senior Ex have been eliminated. Why worry? Everything is great. There is nothing more you need to do, so just relax and have some fun. What could possibly go wrong? It turns out many things can, in fact, go wrong. The most important being that colleges reserve the right to rescind your application if your grades show significant drops in the second semester. This is not a lifeless threat: according to an article by the San Francisco Chronicle, in 2006 alone San Francisco State University rescinded 63 admission offers, Cal Poly San Luis Obispo rescinded 43, UC Berkeley rescinded 37, and UCLA rescinded 73 because students did not live up to their previous years’ grades or did not take the classes they stated they would in the second semester. Even if your application is not rescinded, you may have to suffer through remedial courses you do not need because of poor performance in senior year. Furthermore, there are severe consequences that can happen in high school due to unattended senioritis. At Oceana you do not just have to pass Senior Ex, you must also pass Portfolio in order to graduate. If you do not put in the necessary effort to Portfolio, you will not graduate. You could also fail classes, causing you to not graduate. Use your planner. 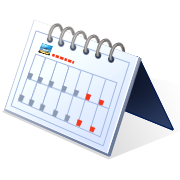 Make notes of all important due dates somewhere you will not forget. If that is your planner, use it. If that is your phone, use that. Just make sure to write down all important dates so you are not caught off guard when your teacher casually reminds you that oh by the way, remember that really important Portfolio deadline? Yeah, that’s tomorrow. Take things one day at a time. If you start thinking about how this assignment is due tomorrow, that project is due in a week, a Portfolio deadline is approaching, that one teacher’s going to give another essay two days from now, you need to start that one thing, and there will be mountains of homework covering the whole thing, you are bound to freak out and wind up doing nothing because it seems impossible. Instead, just focus on the closest due dates and get those done first. If you happen to have some extra time, use it to get a head start on other assignments. Prioritize. Let’s face it. Sometimes, there just is not enough time to do everything. In that case, focus on completing the assignments that have the highest point value attached. Is it more important to write up a paragraph explaining the symbolism in a passage for 20 points, or complete the project worth 200? Have a routine. Create a place with the sole purpose of being where you go to study. It can be a corner of your room, the library, wherever, but only go there to study. Eventually, your brain will subconsciously recognize that this place means studying and will help you focus. Additionally, figure out what time of day you are most productive and make good use of that time. For example, if you are a morning person, get up earlier to put the finishing touches on an assignment. Spend your most productive time being productive and your workload will start to seem more manageable. Reward yourself. 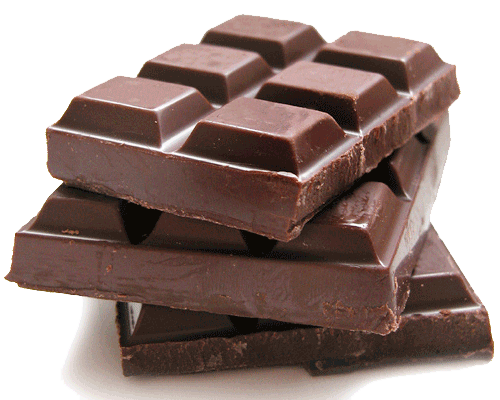 After you complete a difficult assignment, eat some candy. Watch TV. Go outside. Read a few chapters of a good book. Whatever helps you relax. If you can focus on what you will achieve by completing your work, you can get your work done faster. Focus on future goals. It can be hard to pay attention to a lecture all about the finer points of some subject you know you will never have anything to do with after you graduate. Still, you have to pass the class. If you focus on the idea that if you get through this, you graduate or if you get through this, you are one step closer to your ideal job, it makes the lecture more manageable. The class will not, in fact, last forever. It is just a challenge you need to overcome. Keep balanced. Life is not all about school. Do not spend every waking hour thinking about it. Spend time with friends and do things you want to do in addition to keeping up with schoolwork. Have fun. It is senior year, after all.